Welcome to the last chapter of our 7-part mini-course on data science and machine learning. We've really cover a lot of ground. In Chapter 1, you saw a bird's-eye view of the entire machine learning workflow. Then, in Chapter 2, you learned our framework for fast, efficient, and decisive exploratory analysis. Chapter 3 was all about data cleaning, which is perhaps the most important step of all. Next, in Chapter 4, we shared our favorite heuristics for feature engineering. In Chapter 5, we discussed regularization and ensembles, and you learned about 5 algorithms that leverage those mechanisms. And in Chapter 6, we walked through a proven formula for training excellent models after the other steps have been completed correctly. In this guide, we'll give you our best recommendations for where to go from here, including how to transform these concepts into invaluable, practical skills that can significantly impact your career. The first is to go at it alone, and begin applying these skills to projects that interest you. The step-by-step blueprint you've learned will give you a huge head-start. But strike while the iron is hot! Pick a topic, find a dataset, and start practicing. NumPy for efficient numerical computations. Scikit-Learn for algorithms and model training. After you've mastered the core workflow, you can use the rest of this lesson as guideposts for continued study. Our #1 tip for self-study is to skip the textbooks and jump into projects ASAP because it's much faster to learn in context, i.e. "learning by doing." Plus, it will be easier to stay motivated and continue progressing. The second option is to allow us to provide over-the-shoulder mentorship. We've lovingly crafted a Machine Learning Masterclass just for you. Hundreds of other happy students have been through the course, and the satisfaction rate is superb. Option #2: Let us help! Of course, you may be wondering, if we've already given you the complete blueprint, what's there left to cover in the masterclass? The first one is obvious. We couldn't include source code in this crash course because everyone comes from different experience levels. However, thanks to our comprehensive Python Crash Course, you'll learn all of the programming skills needed for machine learning, even if you've never programmed before. In fact, we offer two versions of Python crash course so you can pick the one most suitable for your situation. One for students experienced in other languages - you'll get a concise overview of Python syntax and best practices. One for beginners with little to no coding experience - you'll get a detailed intro to Python and general programming concepts. First, we'll introduce the basics of Python, including data types, operations, and variables. Then, we'll dive into data structures, Python objects that can store and organize other objects. Next, we'll cover flow control and functions. Flow control allows conditional logic and functions keep your code clean and modular. NumPy is the premier Python library for numerical computing and many other data science libraries are built on top of NumPy. Finally, we'll learn all about Pandas, which will probably be your most used package because it helps you store, manipulate, and explore data. Right from Project 1, you'll learn about Model Complexity, which is what we consider to be the "heart" of machine learning. And that's no exaggeration... This is perhaps the single most important concept that couldn't fit into this crash course. Why? Well, for the simple reason that it's best taught alongside illustrative code examples. We promise that this one vital concept will provide you so much clarity about the big picture of machine learning. Mapping functions as a surprisingly effective learning tool. Causes of overfitting and how to deal with it in diverse situations. Cost functions and how they tie into important mechanisms such as regularization. Classification algorithms and their key differences from their regression counterparts. 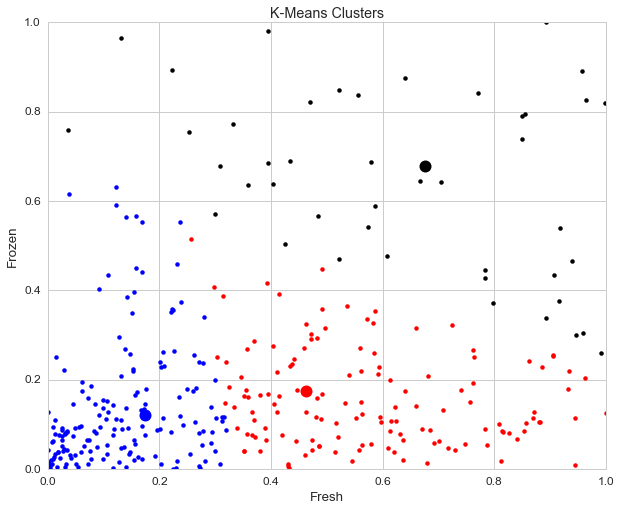 Clustering algorithms and the additional step you should take before training them. Everything is illustrated with code, examples, and visualizations. These are the fundamental building blocks you'll need for almost any project, and it's important to really master these skills. In our masterclass, you'll progress on to carefully planned, end-to-end projects that will allow you to hone each of these skills in context. The learning curve is carefully planned so that you'll be challenged, but not frustrated. In fact, the masterclass is structured after over-the-shoulder, on-the-job mentorship that gently yet quickly brings you up to speed. In this crash course, we've covered the 5 core steps of applied machine learning. However, there are also several important situational steps. When you master these steps, you'll open many more possibilities. For example, some of the most interesting applications require you to creatively restructure the data first (Data Wrangling). In addition, correctly transforming your features will boost your performance significantly (Preprocessing). How to package your model into a script that can be called from a command line or run on the cloud (Project Delivery). The 5 core steps glue everything together, and these situational steps will take your projects to the next level. Just to be clear - Yes, you'll learn all of these skills in the masterclass! As you may have noticed, applied machine learning requires dozens of decisions for each step (i.e. a skilled chef). When have you done enough exploratory analysis? How can you spot potential fixes you'll need to make? Do your visualizations suggest good features to engineer? What are the most impactful hyperparameters to tune? When should you pre-process your features? Which steps should go inside the cross-validation loop? Which performance metrics should you use? In the masterclass, you'll learn simple approaches for tackling these decisions, and you'll get plenty of practice making them. To train professional-grade machine learning models in the shortest time possible, you'll need to master a few additional advanced skills. How to fit Multi-Step Preprocessing Pipelines into cross-validation loops to ensure robust results. How to deal with the Curse of Dimensionality. How to implement Principle Component Analysis (PCA) and how to interpret your components. How to deal with Unbalanced Classes. How to use Probability Thresholds and ROC Curves to improve your classification models. How to perform Multi-Layer Groupbys for data wrangling. How to make Advanced Visualizations for presentations and reports. Best of all, you'll learn each of these important skills in context, which makes them easier understand, retain, and place into the big picture. By now, you'll have learned concepts for data science and machine learning. You'll have a great understanding of where each piece fits into the big picture, and you'll have developed very valuable, practical skills. This is a great time to circle back and review all that you've learned, truly solidifying all these skills and making them truly your own. With the masterclass, review will be a breeze thanks to the free Companion E-Book. And that wraps up the 7-Part Data Science Primer mini-course! By the way, even if you decide not to join the masterclass, you can use the list above as guideposts for further studying. You've learned the core blueprint, so you now have a very strong foundation to go forward. Learn more about the masterclass! I was concerned whether the course would be accessible. But I found that it is very well thought out and the teaching strategy fit well with my learning style. I've gotten a lot better at Python and I now know how to apply Machine Learning to business problems. I believe anyone interested in learning Machine Learning could definitely use this course as a door to accomplishing that. Before joining, I didn't know if this would really advance my knowledge of data science and machine learning to help get or start a job in the field. So far, it has been really useful in learning applied machine learning. I recommend this course because the real world application of machine learning is hard to see, and this course cuts through the trees to see the forest. Or go back to the Primer Hub page.